The Clarence T.C. Ching Foundation donated $5 million yesterday to the University of Hawaii for a new athletics complex on what is now Cooke Field. 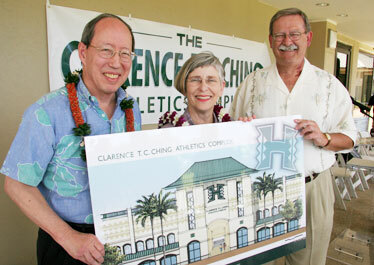 Foundation Chairman Jack Tsui, left, UH-Manoa Chancellor Virginia Hinshaw and UH President David McClain showed a rendering of the complex. The University of Hawaii athletic department got a huge boost yesterday with $5 million from the Clarence T.C. Ching Foundation. Officials said it is the largest single donation made to the school strictly for athletics. It will be used to refurbish Cooke Field, which will be renamed the Clarence T.C. Ching Athletic Complex. Athletic director Jim Donovan said resurfacing of the practice field might be done by the end of October. "But we'll be seeing if we can't push that up," Donovan said. UH had hoped that the field would be usable by the start of football practice in August. But coach Greg McMackin said the new timetable is no big deal. "It's scheduled to be ready when we really need it, when it starts raining a lot," McMackin said. The university's Board of Regents also approved a proposal to lower admission prices for some seats at UH athletic events. Clarence T.C. Ching made his name in Hawaii as a real estate developer and philanthropist. 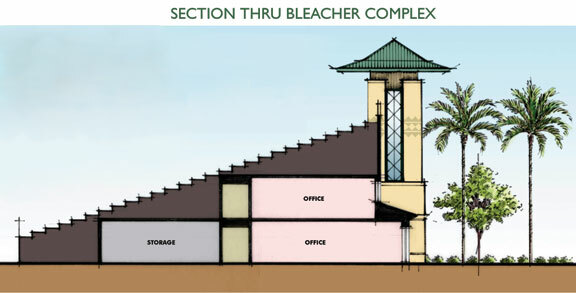 But the man for whom a refurbished sports facility at the University of Hawaii will be renamed -- Ching Field, formerly Cooke Field -- was also passionate about athletics. Family members said he would have strongly approved of yesterday's $5 million gift from his foundation to the UH athletic department, the largest amount ever given to the school strictly for athletics. Artist renderings of the new Clarence T.C. 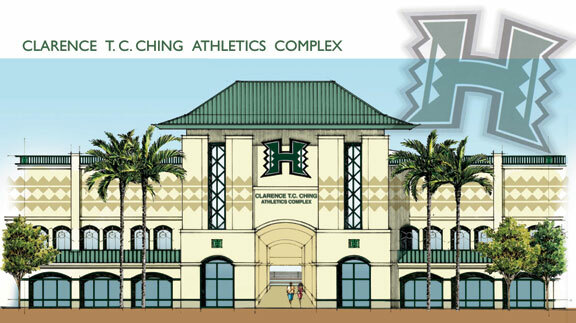 Ching Athletics Complex are shown here: a front view, above. When Ching died, 23 years to the day before yesterday's announcement, it was due to a heart attack suffered while playing golf at Waialae Country Club. "In the old days, back at Honolulu Stadium, he sponsored football teams," said his granddaughter Cathy Ching, a trustee for the foundation. "He was also into boxing." The Ching Foundation was established in 1967. It received a boost of $130 million with the sale of Kukui Gardens last December. The school is also getting about $1.2 million from the Legislature to help with the renovation, UH President David McClain said yesterday. The first construction phase is resurfacing of the football field, which UH athletic director Jim Donovan hopes to have done during the upcoming season. Eventually, there will be locker rooms, offices, storage areas, a press box and a scoreboard, Donovan said. The field will be used by several sports teams as well as for intramural, band and ROTC activities. 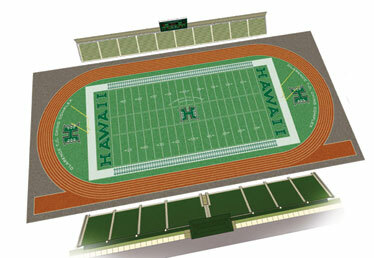 There will be seating for 3,300 to 3,500, making the venue suitable for high school games. "We think it will be a great beginning to private-public partnerships," said Jack Tsui, a foundation board member and UH supporter who was "catalytic" in securing the donation, according to McClain. Tsui said he received the blessings of a member of the Cooke family in changing the name of the facility. "We're trying to fulfill (Clarence Ching's) wishes of helping out the community," Cathy Ching said. "He was very, very generous to his family and his extended family." That ohana now includes the UH athletic department.